It’s no secret that the Nazis were into some strange, occult stuff, but some of the weirdest rumors about the Third Reich come from their supposed “miracle weapons,” including a giant, bell-shaped device called “Die Glocke” (The Bell), which supposedly generated an anti-gravity field. 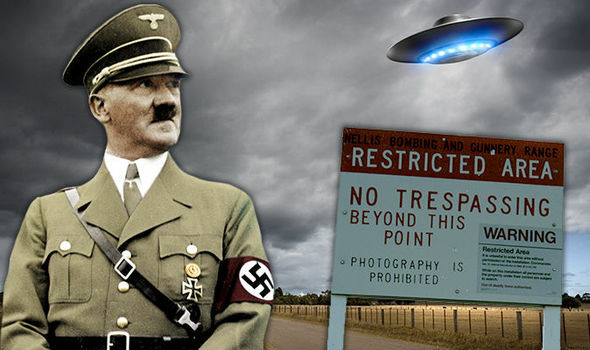 According to author and former aerospace engineer William Tompkins, there was a lot more behind these stories than just occultism and rumors of superior German engineering.He says that the Nazis were being aided by a race of reptilian aliens. The “Draconian Reptilians,” as Tompkins calls them, were the ones who were supplying advanced alien technology to the Nazis, including anti-gravity tech and beam weapons. So how did the Allies beat them? With the help of a different race of aliens he says. Tompkins claims that the US and others were assisted by a race of aliens called the Nordics, who not only evened the playing field against the Reptilians, but also helped the US Navy to construct “deep space battle groups,” including a “2.5km Naval Spacecraft Carrier and a 1.4km Naval Spacecraft Battle Cruiser,” all of which began operating in the 1970s or ’80s. Tompkins even says some of his coworkers and secretaries were Nordic aliens in disguise here on Earth. Before his death, Tompkins claimed that the battle for Earth isn’t over. he says the Earth has been under attack from Reptilian space armadas for years, with the human-Nordic alliance fending them off . I recommend not to take the infomations given by William Tompkins as pure fact or pure rubbish. Instead consider them as a possibility, keep in mind the informations he shared as it might one day be more relevant to you and might begin to make more sense as you continue your quest for the truth.